Before we discuss my favorite new recipe, vegan sweet potato burger, I want to talk about the key ingredient; sweet potatoes. If you are an active member of our health and wellness community, you have probably heard me speak of the health benefits of sweet potatoes a few times. But it is worth repeating because they are a true superfood. Here are my top 5 favorite reasons to consume more sweet potatoes and I recommend 3-5 servings a week. Sweet potatoes are high in vitamin B6, vitamin E and an excellent source of vitamin C. Vitamin B6 can impact your mood, your sleep, and your pain levels. B6 is often depleted by stress. If you don't replace your B6 with the right food, anxiety and stress can worsen. So if you have a lot of pressure in your life, I highly recommend lots of sweet potatoes. Sweet potatoes do not cause sugar spikes. Although most calories in sweet potatoes come from carbs, they are low-glycemic carbs and rich in fiber, which helps with blood sugar control. Sweet potatoes are high in carotenoids. Beta-carotene, lycopene, and lutein are all different varieties of carotenoids in sweet potatoes. They all act as antioxidants with potent chronic disease fighting properties and protect cells from free radicals. Last but not least. Sweet potatoes are the fountain of youth! The people from Okinawa have a life expectancy among the highest in the world, and 27% of their diet consists of sweet potatoes. If you are asking yourself how are you going to eat 3-5 servings of sweet potatoes a week? There are many ways to consume them. 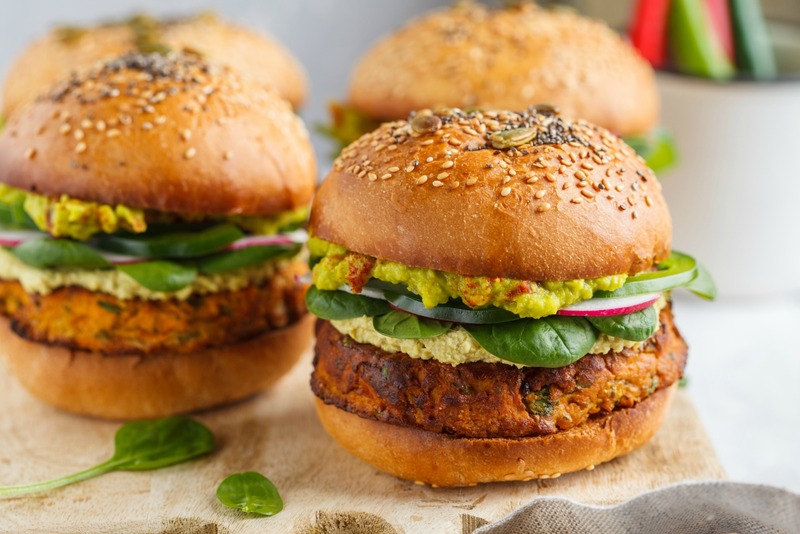 Like this vegan sweet potato burger which will go down as one of my favorite new recipes. Or keep it simple. Just peel, cut and roast the potato chunks in the oven until they are soft and caramelized for extra sweetness. Or cut into wedges, toss with some seasoning and bake to make sweet potato fries. Also, don't feel like you always have to use the same spices for this vegan sweet potato burger. Switch it up. You could create an Asian inspired version by adding garlic, ginger, basil and soy sauce. Try Mexican flavors, by adding some oregano, cilantro, cumin and chili powder. That selection of spices would taste delicious topped with a roasted poblano pepper. If you love this vegan sweet potato burger recipe as much as I did, I know you will enjoy my Twice-Baked Stuffed Sweet Potato with Cashew Cream and this Chickpea Stew with Sweet Potatoes, Spinach, Lemon and Roasted Red Pepper Puree. If you want to learn more about plant-based nutrition and how to get started on a vegan diet, Ordinary Vegan has a podcast. You can listen here on this website or in iTunes. Swap out the beef for one of the healthiest foods on earth - sweet potatoes. Cook until soft about 45-55 minutes. Skin sweet potatoes when cooled, and place into the food processor. Add all the other ingredients to the food processor except for the garbanzo bean flour and bread crumbs and process until smooth. Remove the mixture to a large bowl and mix in the garbanzo bean flour. Add the gluten-free panko breadcrumbs and combine. Adding more breadcrumbs if still too sticky. Form into 4-6 patties. Spray a large non-stick saute pan with a little oil and heat over medium-high heat. Add the patties and cook until brown, turning, about 3-4 minutes on each side. To serve, place buns on a sheet tray and place in the oven. Toast until golden brown, about 3-5 minutes. On the bottom of the bun place sweet potato patty. Top with mashed avocado, spinach leaves and lettuce. Spread the horseradish sauce on the top bun and place on top of the burger. Add all the ingredients to a food processor. Blend until smooth. Taste for seasonings. Is there a substitute for aquafaba? Hi Mary – Yes you can use ground flax seed eggs – 2 tablespoons of ground flax seed whisked with 5 1/2 tablespoons of water – place in refrigerator for 10 min to thicken. This equals 2 eggs. Or you could use Bob’s Red Mill egg replacer. Hope that helps. Thanks for being part of our healthy community! And just how do you cook chick peas please. Hi Deborah – I like using cooked chickpeas in this recipe which come in a 15-ounce can or carton. But if you are cooking dried chickpeas – here is what I recommend. Place the dried chickpeas in a large bowl and cover with cold water. The chickpeas will expand to over double their size, so make sure you cover by several inches of water to allow for expansion. Cover the bowl with a clean towel and let them soak for approximately 12 hours. Drain the water and rinse the beans before cooking. Place the chickpeas into the bottom of a large pot and cover with water. Use 1 quart of water per 1 cup of chickpeas. Bring the chickpeas to a boil, then reduce heat and reduce the chickpeas to a simmer. Add 1/8 of a teaspoon of salt per cup of chickpeas. Let the beans cook for approximately 50-60 minutes until desired tenderness. Certain dishes require very tender beans (like hummus), while other dishes call for firmer beans like stews and soups that will be cooked again. Adjust the cooking time to achieve the desired tenderness for your purposes. Hope that helps. Thanks for being part of our healthy community! 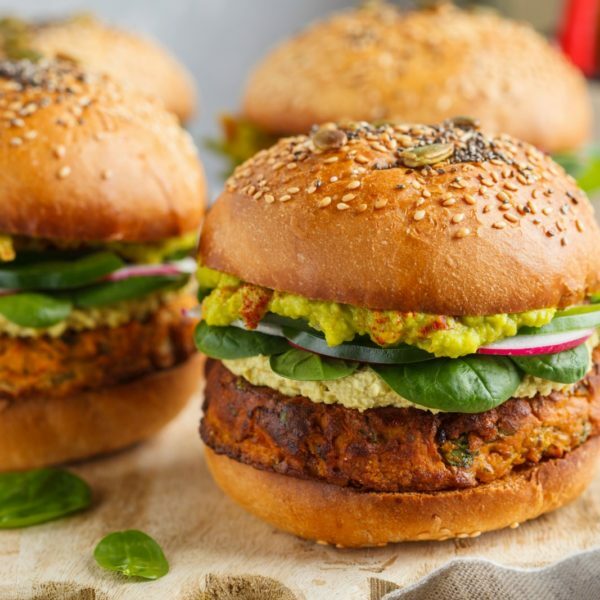 What can be used in place of chickpea flour in the sweet potato burger? Hi Linda – You could use any kind of flour. Whole wheat word work if it doesn’t need to be gluten-free. I like the chickpea flour because is has the complex carbohydrate starch which the body is able to slowly digest and use for energy over time, making it a much more beneficial flour then plain white flour. Looking forward to trying this recipe. I’m trying to reduce the amount of oil I use, and am wondering if I can cook these in the oven on parchment paper instead. Also, I wasn’t aware until recently that Worcestershire sauce isn’t vegan. It has anchovies in it. There are vegan options available though. Hi Janine – Meant to put vegan in front of the Worcestershire sauce – What I used was vegan and it was delicious. Added a nice umami. Yes you could definitely bake these on parchment paper. Thanks for stopping by and thanks for being part of our healthy community! What can you use instead of Vegan Worcestershire sauce? Hi Brenda – Low-sodium soy sauce or Tamari sauce should work fine. Thanks for dropping by! They turned out amazing, and thanks for the reply. Next time I will try to use Vegan Rochester sauce. This looks incredible! And I Love Vegan Sweet Potato Burger. Thank you for sharing. Thanks for being here and for being part of our healthy community! Can these burgers be frozen as I would be the only one eating them? This is the first recipe I tried from your site — it was delicious, even though I forgot to put in the onion and didn’t make the horseradish sauce. I doubled the recipe and made a lot! We ate them warmed up over the next several days and ate them with different things (hot peppers, chopped up on a salad, cold dipped in ketchup), and they were great that way too. Hi these burgers look amazing and can’t wait to try them. I am gluten free but don’ t use gf bread as i try to avoid too many grains, what could I use instead? Many thanks. Hi Karen – I have never tried this but perhaps some ground nuts could work as a binder for this recipe. I would recommend almonds or cashews. Hope that helps and thanks for being part of our healthy community!